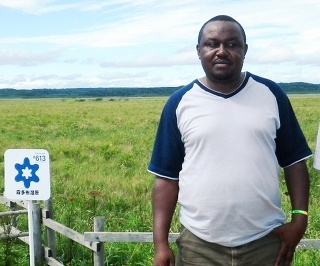 Mr. David Musingo of Uganda Wildlife Education Centre participated in Ecotourism Course of 2012. He kindly sent us his current challenge for conservation and sustainable use of biodiversity. You can read it by downloading the PDF file below. 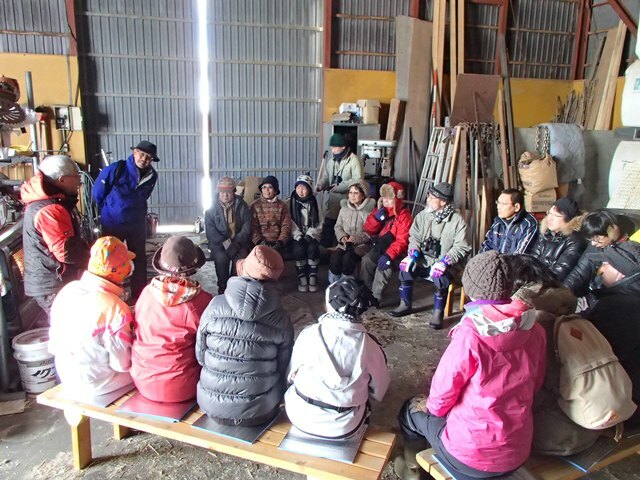 As part of the Wetlands and their Regional Blessings theme of studies conducted from 2013 to 2015, the KIWC Technical Committee held an on-site study meeting in Hamanaka Town on November 6, 2013, to promote the observation of examples in the Kushiro region. A total of 14 people, including Technical Committee members, visited the site of the Project on Connections between Wetlands and the Sea, which has been run by the Kiritappu Wetland National Trust since 2012. The project focuses on iron and other nutrients carried into Biwase Bay by the Biwase River from forest and wetland areas. The river flows from forestland into the bay en route to Kiritappu-shitsugen (Kiritappu Wetland). This non-profit organization works to 1) scientifically highlight wetland-marine connections based on observation of how these nutrients affect the growth of marine organisms, and 2) promote the establishment a Hamanaka marine product brand. Following a presentation by Trust representative Ms. Naoko Kouchi on the project, attendees visited a sample water collection site on the Biwase River and a habitat of surf clams, which are seen as an indicator of water conditions. On the shore of Biwase Bay, local fisherman Mr. Takashi Watanabe provided information on sea surf clam habitats and showed how they are manually harvested using a sickle-like tool. After the observation, attendees spoke with staff from Hamanaka Town Office and a fisheries cooperative at Kiritappu Wetland Center. The topics of the lively and interactive discussion covered survey methods, fishing conditions and other related matters. Technical Committee members expressed an interest in trying Hamanaka surf clams and sea urchin, which are renowned for their exquisite flavors, at the next opportunity. The second JICA eco-tourism course held from September 9 to October 14, 2013, was attended by eight administrative officials working in the field of tourism promotion from Albania, Argentina, Georgia, Kyrgyz, Peru, Serbia, Macedonia and East Timor. As in the first training session, the group learned about eco-tourism in the Kushiro region and other parts of Hokkaido, Tokyo, Kyoto and Okinawa. KIWC Technical Committee Chair Mr. Hisashi Shinsho again served as leader throughout the course. 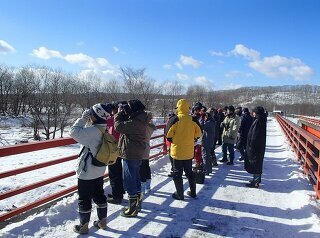 Trainees experienced a wide variety of eco-tourism programs in Hokkaido’s autumnal environment. These included horseback trekking on indigenous Dosanko Horses, a fishing boat trip to an uninhabited island and an environmental study session with local children. Attendees analyzed these programs at weekly meetings and discussed what they had learned from them. 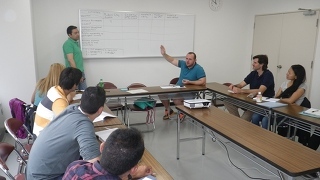 In Kyoto, trainees attended a workshop with university students majoring in tourism, and also exchanged views with young students on eco-tourism in their respective countries in a cafeteria at the university where the workshop was held. On the last day of the course, trainees presented their action plans at the JICA Tokyo International Center. The concepts were tailored to actual situations in each country, and included ideas developed in Japan to encourage the use of natural and cultural regional assets in order to promote tourism and the allocation of profits in a way that will benefit the relevant locality. An environmental survey was conducted to clarify changes resulting from work conducted in the Kayanuma district to restore the meander of the Kushiro River, which runs through Kushiro-shitsugen (Kushiro Wetland). Twenty-seven people canoed from the part where the meander was restored to a natural stream section in Sugawara (approx. 5.5 kilometers) observing riverbank trees, landscapes, animals, plants and other elements of the surrounding environment on the way. During the survey, participants stopped twice near the lower end of the restored old channel at sandbanks that formed after the meander’s restoration and elsewhere to investigate environmental changes. To check the sedimentation status, the surveyors measured sandbanks using a long tape measure and observed sediment structures using a special tool known as a soil auger. After the canoe survey, the contributors went to a canoe house near Lake Toro to review the results. 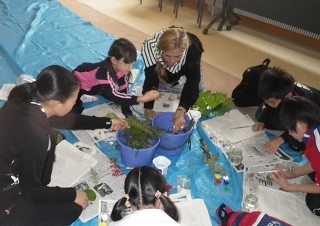 Observation records and findings were shared among canoe groups, with presentations covering sedimentation and erosion seen in the restored channel, plant growth on sandbanks, encounters with red-crowned cranes, Hokkaido sika deer, various types of dragonflies and other forms of wildlife, and autumnal riparian forests. The results showed clear changes in the restored channel and highlighted the wealth of flora and fauna in the natural environment of the Kushiro River.